Frankenstein assured the institutional review board (IRB) that he had the highest ethical standards. “If I do succeed in fully animating a human or human-like creature, I will provide the creature with information about the study and allow it, if it is capable, to choose whether or not to participate further in continued observation and study,” noted the budding scientist. If the creature had “diminished capacity,” Frankenstein promised to bring in a third party to act in its interest and treat “the being” in accordance with recognized standards. Of course no such proposal ever went to bioethicists at the University of Ingolstadt, where the fictional Frankenstein created his monster. In 1790, even a real Frankenstein would have faced no ethical reviews. But the proposal does exist in a 2014 paper, which speculates about whether the Frankenstein story would have had a happier ending if 21st century safeguards had existed 2 centuries ago. It is one of many riffs on the novel to be found in biomedical literature. In conceiving her story, Mary Shelley was influenced by the nascent medical science of the day and by early experiments on electricity. In return, Frankenstein has haunted science ever since. First published anonymously in 1818, the book and subsequent films and plays have become what Jon Turney, author of the book Frankenstein’s Footsteps: Science, Genetics and Popular Culture, calls “the governing myth of modern biology”: a cautionary tale of scientific hubris. And as with all long-lasting myths, it is not one myth, but many, as a search for “Frankenstein” in the PubMed database—the main catalog of life sciences papers—makes clear. Scientific literature, like the popular press, is rife with references to Frankenfood, Frankencells, Frankenlaws, Frankenswine, and Frankendrugs—most of them supposedly monstrous creations. 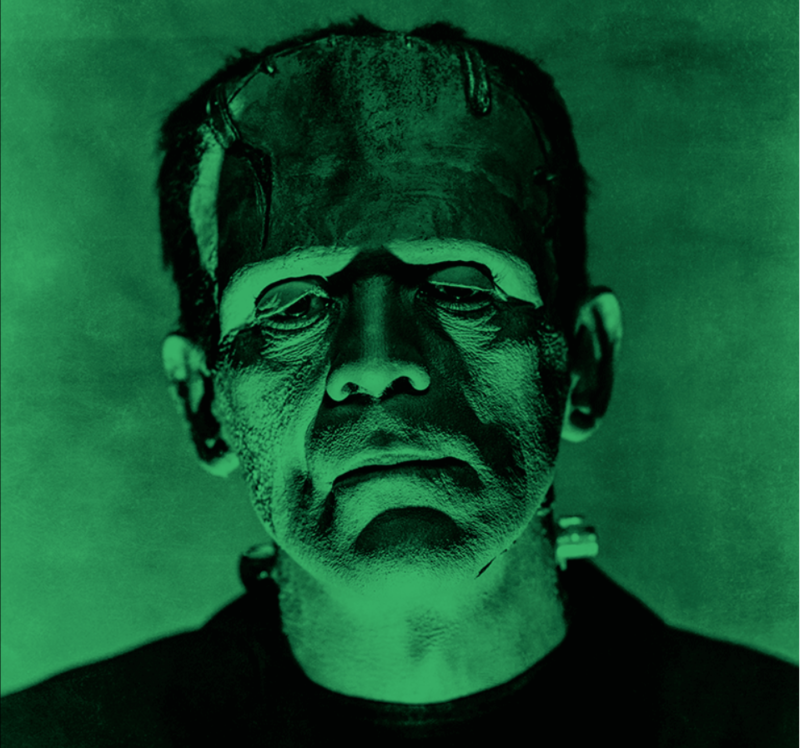 Other papers explicitly mentioning Frankenstein—there are more than 250 of them—analyze the science behind the novel or even, in a twist that can be down-right bizarre, draw inspiration from it. Several reports in psychological journals delve into the state of mind of its author when she first imagined the tale during the summer of 1816. Then Mary Wollstonecraft Godwin, she was visiting the poet Lord Byron at Villa Diodati, a mansion he had rented on the shores of Lake Geneva in Switzerland. She was 18, accompanying her married lover, the poet Percy Bysshe Shelley. Her stepsister, Claire Clairmont, was there, as was Byron’s live-in doctor, John William Polidori. It was the “year without a summer,” a climatic anomaly caused by the eruption of Mount Tambora in the Dutch East Indies, and endless rain and gray skies kept the guests cooped up. Byron suggested as a party game that they each write a ghost story. The Journal of Analytical Psychology paper’s author, Ronald Britton, a prominent psychoanalyst, links these tensions and griefs to the daydream in which Mary Shelley first envisioned Frankenstein’s monster—”the spectre which had haunted my midnight pillow,” as she later put it. The “background facts to her nightmare,” Britton writes, invoking Freud, “opened a door to unconscious phantasies of a dreadful scene of childbirth.” He adds that after losing her first child in 1815, Shelley wrote in her journal that she dreamed about the baby coming back to life. “I thought that if I could bestow animation upon lifeless matter, I might, in process of time, renew life where death had apparently devoted the body to corruption,” she wrote the year before imagining Frankenstein. More horrors were to follow for Shelley after she completed the novel. She married Percy after his first wife’s suicide, only to lose him 6 years later when he drowned in a sailing accident. But she called on science, not psychology, in explaining how she “came to think of, and dilate upon, so very hideous an idea” at 18 years of age. Among the influences she cites in a preface to an 1831 edition of her novel is Luigi Galvani, who in 1780 found that an electrical charge could make a dead frog’s legs twitch. It was Percy who may have acquainted her with galvanism, which Frankenstein explicitly mentions as the key to reanimation in the 1831 edition. As a boy, the poet “had dabbled with electricity (on his sister’s sores and the family cat),” another study in Progress in Brain Research notes. In 1780, Italian scientist Luigi Galvani showed that a spark could make the muscles of a dead frog contract—inspiration for Frankenstein‘s author, Mary Shelley. Many a paper has attempted to parse other ways in which the science of the day influenced Shelley’s tale. A 2016 essay in Nature by a U.K. biographer noted that her novelist father was friends with electrochemist Humphry Davy and with William Nicholson, a co-discoverer of electrolysis, the technique of triggering chemical reactions using electricity. Several accounts point to the influence of Byron’s physician, Polidori (who later poisoned himself with prussic acid), and his discussions of experiments on spontaneous generation by Erasmus Darwin, grandfather of Charles. A 2004 paper in the Journal of Clinical Neurophysiology that reviews the “electrophysiological undercurrents for Dr. Frankenstein” notes that Shelley could not have missed the widely discussed work of Giovanni Aldini, Galvani’s nephew, who in 1803 zapped the heads of decapitated criminals in an attempt to reanimate them; he imagined this could be used to resuscitate people who had drowned or suffocated and possibly to help the insane. Over time, the influence ran from the novel back to science. “From Frankenstein to the Pacemaker,” in IEEE Engineering in Medicine and Biology Magazine, tells how 8-year-old Earl Bakken in 1932 saw the famous Frankenstein movie starring Boris Karloff, which “sparked Bakken’s interest in combining electricity and medicine.” Bakken would later found Medtronic, develop the first transistorized cardiac pacemaker, and open a museum devoted to electricity in the life sciencesthat’s housed in a Gothic Revival style mansion in Minneapolis, Minnesota. Neighborhood kids call it Frankenstein’s castle. Indeed, many scientific studies proudly reference Frankenstein, mainly because they combine disparate parts to create a novel entity that the researchers present as delightfully chimeric. A milk sugar enzyme fused with a carrier protein. An atlas of the head and neck to guide radiotherapy, created by merging views from different patients. A face recognition study that swapped the eyes, noses, and mouths of former President George W. Bush and former U.S. Secretary of State Colin Powell. A “Frankenrig” used to create 3D animations, made by mixing and matching bones from different skeletons. But by far the bulk of the scientific literature hand-wrings, ponders, and philosophizes about the most familiar form of the Frankenstein myth, which Shelley flicked at in her “Modern Prometheus” subtitle: the idea that mad scientists playing God the creator will cause the entire human species to suffer eternal punishment for their trespasses and hubris. Reanimation was in fashion in 1818. Scottish doctor Andrew Ure attempted the feat on a corpse. “Mary Shelley, Frankenstein, and The Dark Side of Medical Science,” a 2014 essay published in the charmingly incongruous Transactions of the American Clinical and Climatological Association, ticks off a diverse list of recent experiments that have drawn the “Franken-” label: the cloning of Dolly the sheep, the engineering of a highly lethal H5N1 bird influenza that could more easily infect mammals, the synthesizing of an entire bacterial genome. Other triggers of Frankenstein-ish fears have included in vitro fertilization, proposals to transplant pig organs into humans, and tomatoes endowed with genes from fish to make them freeze-tolerant. “Obviously, I don’t buy into that theme,” he adds. Unlike the Frankenstein character, who initially didn’t consider how his work might go wrong, Venter says he recognizes that editing and rewriting genomes could “contaminate the world” and cause unintended harm. “I think we need to be very smart about when we do it and how we do it,” he says. He thinks Shelley “would highly appreciate” his work. Previous Post Could ultraviolet lamps slow the spread of flu?